During the last several days, I have been under a great burden from the LORD. The burden became so intense at times that I was in anguish over what I was feeling in my spirit. Whenever I went to pray, travailing prayer would begin to flow. This would go on for a while until I felt a sense of release and Shalom. This has happened before whenever there was imminent danger of massive loss of life. In the past whenever I would pray and intercede the feeling would lift and be replaced by Shalom and a sense of release. It would not come back. However, this time it kept coming back again and again not matter how much I prayed and travailed in the spirit. Eventually I told the Holy Spirit: "What is going on Holy Spirit, why am I feeling like this? Please show me!" Well, on Friday June 30 I was alone at home and spent the whole evening in the spirit. "I was taken to a room which I perceived to be in Washington DC. I saw three men in the room. One of the men was sitting with his back to me so I was not able to see his face. I perceived that he was a prominent and apparently very powerful figure. Another man, which appeared to be a high ranking influential member of the U.S. government, was sitting across this man. He looked familiar, but I can't remember his face. Then I saw a third man who was standing very close to the U.S. Government VIP ; he did all the talking trying to persuade him of something that was obviously very secret and extremely important, because of the way the man was speaking to this individual. However, he was completely reluctant to agree to whatever the other two men were trying to persuade him to agree to. This went on for a while. The U.S. Government VIP kept shaking his head and set in not agreeing to what he was being told. The man who was standing kept looking at the man with his back to me, as if asking him what to do next. Then I saw the man who was standing leaned forward and whispered something secretly into the U.S. Government VIP's ear. When that happened, his face changed as he looked troubled. Then slowly he nodded his head as if to agree to whatever the other man had whispered in his ear. Slowly the man who was talking to the U.S. Government's VIP stood up straight with a victorious look on his face, and looking at the third man sitting across the senator nodded to him letting him know that he had finally agreed." I awakened. Although it was not revealed to me the content of what this meeting was all about, I did get the feeling that something was not right. There seemed to be a lot of pressuring going on during this meeting by two of the men against this one reluctant high ranking influential U.S. Government figure. After much prayer and meditation on what transpired in this dream, I began to get a clearer focus as to the meaning behind what was shown to me. It looked like what the man was asking went against the principles and conscience of this high ranking U.S. Government figure, because he was so reluctant to agree to it. At one point, when the man leaned forward and secretly whispered something into his ear, it looked like it could have been a veiled threat against him, his family or both. Whatever it was, it caused the high ranking U.S. Government VIP to instantly give in and agree to whatever the other two men were planning on doing. This whole episode did not feel right in my spirit. I sensed that it was something being done behind the back of President Trump and something that would definitely be bad for him and this administration. 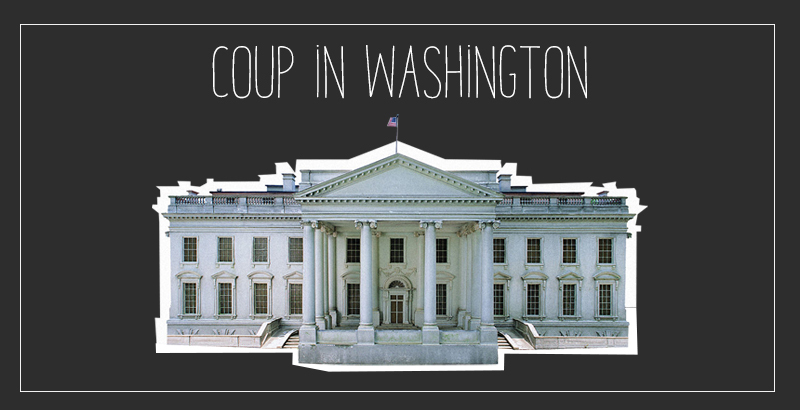 It could have been something way more serious than a coup. However, at this time it has not been revealed to me the details of this dream. We need to continue to pray for President Trump and pray God's protection upon his life and his family. This is extremely urgent and I encourage everyone to keep this a top priority prayer target at this time. We are living in perilous times. Draw close to the LORD Jesus Christ, and make sure that you are saved as we draw near to His return. Shalom. 1 Corinthians 14:25 "And thus are the secrets of his heart made manifest; and so falling down on his face he will worship God, and report that God is in you of a truth." 2 Kings 6:11-12 "Therefore the heart of the king of Syria was sore troubled for this thing; and he called his servants, and said unto them, Will ye not shew me which of us is for the king of Israel? And one of his servants said, None, my lord, O king: but Elisha, the prophet that is in Israel, telleth the king of Israel the words that thou speakest in thy bedchamber."